Every day is an opportunity to show you care and the other day I had 4 beautiful opportunities to let 4 ladies know I love having them in my life. It happens to be that they all had their birthdays in a matter of 2 weeks. Surely I left ALL for the last minute so found myself making cards in a hurry. But wait, hurry doesnt mean simple. Nah! I can't do THAT! Well, I tried and it didn't work. Ha! Cada dia es una aportunidad para mostrar a alguien que lo quieres y el otro dia yo tuve 4 hermosas oportunidades para dejarle saber a 4 bellas amigas que amo tenerlas en mi vida. Claro, todas cumplieron anitos en menos de dos semanas. Por supuesto me halle haciendo 4 tarjetas a la prisa, pero a la prisa no significa que tenian que ser simples. Ja! Lo intente pero no me funciono! 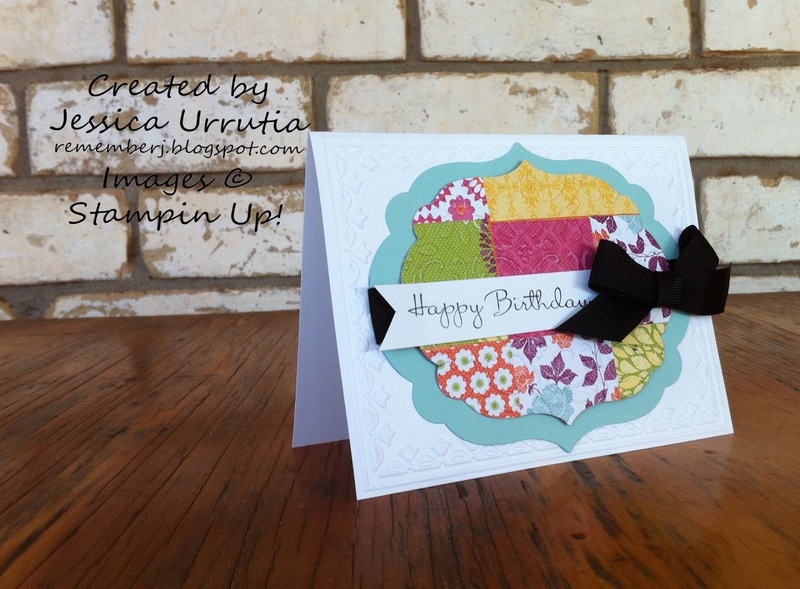 These cards were inspired by quilts...I've been looking in Pinterest on different quilting ideas. My soon-to-be project. So, why not make a paper quilt. Let me know if you like them and come back tomorrow for a wonderful and easy (promise!) Christmas card. Can't wait to show you! Estas postalitas fueron inspiradas por edredones (quilts)....He estado mirando ideas para hacer uno pronto, bien prontito y pues por el momento las puedo hacer con papel. Dejame saber que piensas y regresa manana para que veas una tarjeta navidena hermosa y sencilla (promesa!). No me agunto para poder ensenarselas. For these I used scrap pieces of DSP (love this paper, so I have to use every bit of it). 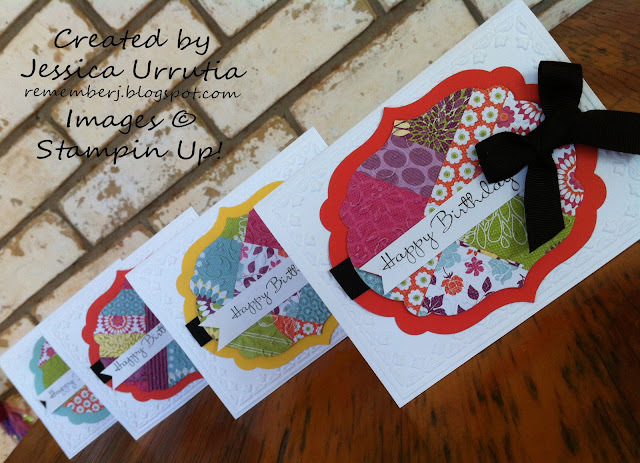 And the Multipurpose Adhesive Sheets from Stampin'Up! They are so cool to use! Especially for this! Do for your paper projects what the Big Shot Fabric Adhesive Roll does for our new fabric—turn your Big Shot die cuts into stickers! Simply apply an adhesive sheet to your card stock, Designer Series paper, or other base material, crank through the Big Shot machine, and peel the backing paper off. 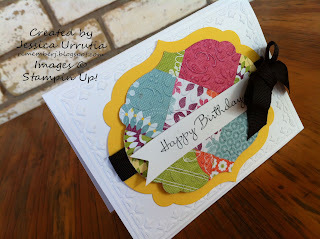 Apply your die cut to any kind of project for quick and super easy accents. 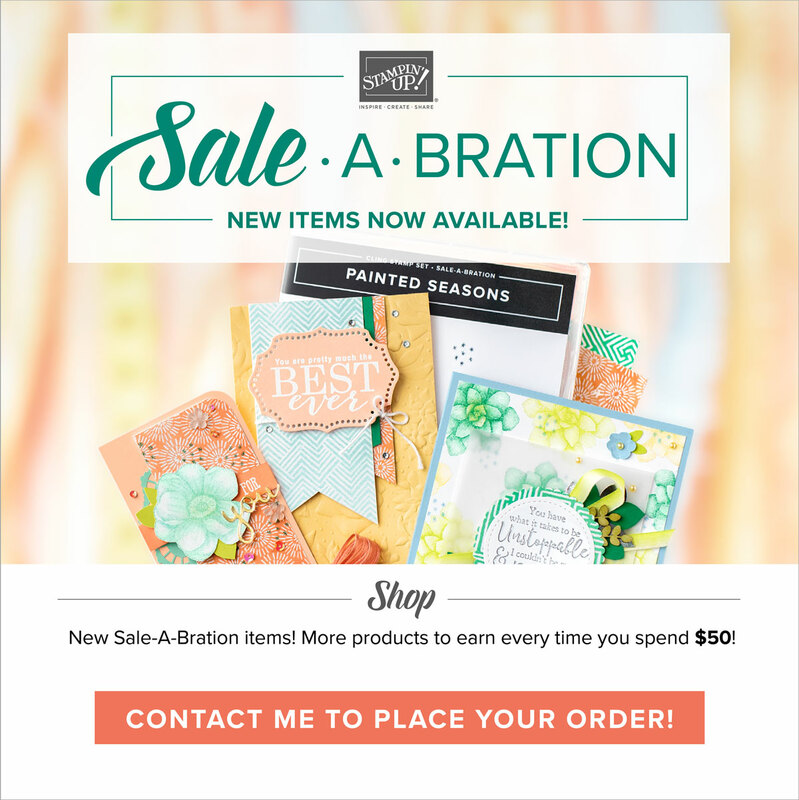 ■ 12 adhesive sheets, 12" x 12"
■ Add adhesive to die cuts. 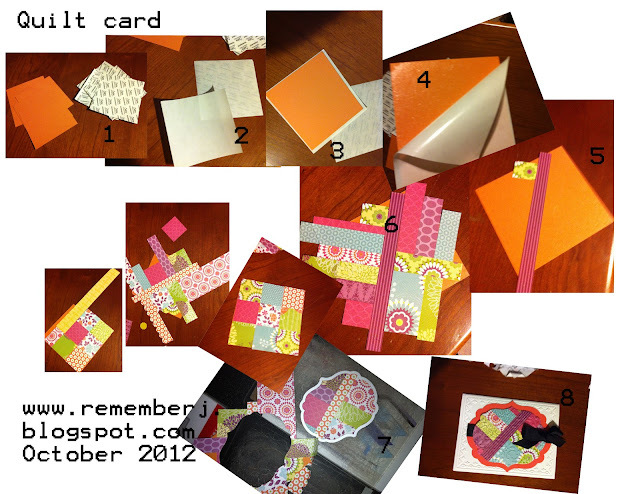 Simply apply card stock or DSP to the adhesive sheet, run through the Big Shot, peel off backing paper and adhere. Para estas tarjetitas use pedacitos de papel de disenador (me encanta este en particular tal que quiero usar todos los pedacitos de el). 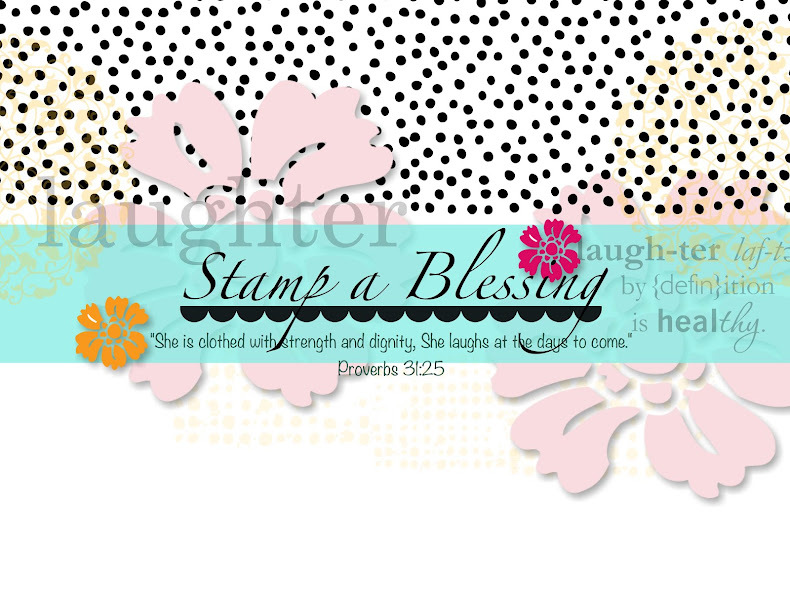 Tambien use las paginas adhesivas de Stampin'Up! Son bien cheveres, en especial para esta tecnica. Hope you like this simple picture tutorial. Espero les guste este tutorial de fotos. Step 1 Cut CS to 4" x 4 1/4" and a piece of Multipurpose Adhesive sheets a 1/4" bigger. Corte Cartulina a 4" x 4 1/4" y un pedazo del papel con pega 1/4" mas grande que la cartulina. Step 2 Take off the top layer of the Adhesive sheet. Quite la primera capa del papel con pega. Step 3 Stick your cardstock to the Adhesive Sheet. Pegue la cartulina al papel con pega. Step 4 Take off the other side of the Adhesive Sheet to expose the sticky side. Quite el otro lado del papel con pega para exponer el area adhesiva. Step5 Start sticking your pieces of Cardstock as shown, I made different patterns, not all the same. Comience a poner los pedacitos de papel de disenador como desee. Puede seguir uno de estos patrones que presento. No todos son iguales. Step 6 Cover all your CS with pieces of paper. Cubra todo con e papel de disenador. Step 7 Die cut your piece of CS with your framelit of choice. Corte su cartulina con el "framelit" que desee en la "Big Shot". Step 8 Embellish as desired. Decore como desee. Espero les haya gustado. 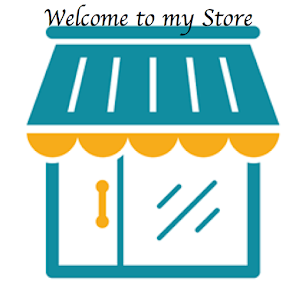 Si hacen una pongame su link hacia su blog o envienme un email para ver sus creaciones. Thanks you so much for visitar, it is a joy to share with you! Muchas gracias un gusto compartir com ustedes. Gx por visitar! Jessica!!!!! I absolutely LOVE these! I love everything about them- the "fabric" choice, the texture, the colors, the quilted look (I am getting started on a project here sometime, when I have time...lol)This was a home-run for you!!! You ROCK my friend!